Picking songs for your wedding ceremony is not an easy task. With so much to think about and organise in the lead up to the big day, ceremony music can be one of those things that gets left to the last minute. If you don’t know where to start with your song choices, fear not. Even as a wedding musician, it took me ages to decide what songs to have at my own wedding! For most wedding ceremonies you’ll need to make music choices for the processional (entrance) and the recessional (exit) – but there’s also usually a space for two or three songs during the signing of the register. So that’s up to five songs that you’ll need to have lined up. Why have live music at the ceremony? 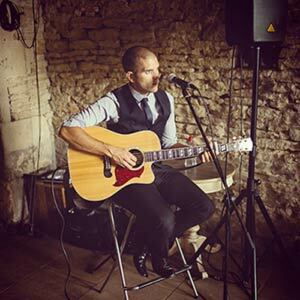 As a singer and guitarist, part of my service is having your bespoke songs played live and acoustic at the wedding ceremony. It’s a great way of giving your ceremony a personal, unique touch – and is a lot more elegant than having to arrange someone to play songs from a phone or iPod! The big advantage of having a live musician like myself is that I can adapt your chosen song so that it matches the walk down the aisle. So that might be cutting out verses or even changing lyrics – anything is possible so you can truly make your wedding music unique to your big day! To read more about my live music services click here. To see my full repertoire click here. Following on from my previous blog posts Top 10 Wedding Ceremony and First Dance songs and Top 10 Unusual Wedding Songs, I thought it would be useful to put together a more comprehensive list. Some of these are slow and romantic, some are upbeat and fun – so these should suit most types of ceremony, depending on the ambience you want to set. Many of these would also make a good first dance song.